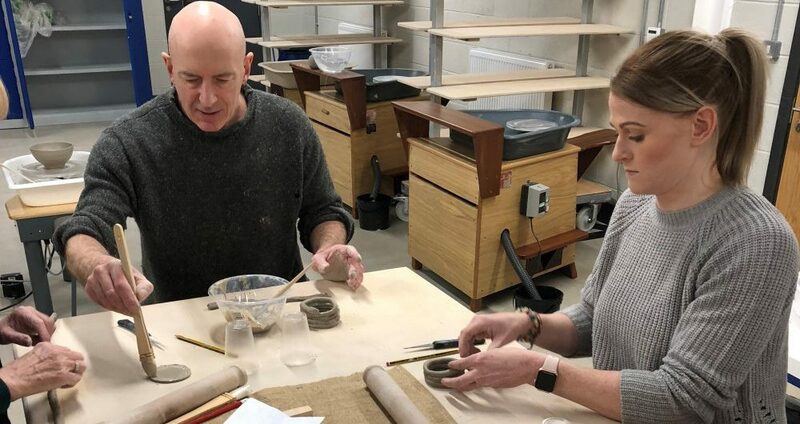 Your teacher Nicholas Marsh, who has over thirty years’ worth of experience, will help you to develop your ideas in clay over a 10 week period. Whichever clay discipline you wish to develop and learn Nick will be on hand to help you to progress within this area whether you would like experience in throwing, slabbing, texturing, decorating or firing. This evening ceramics course is aimed at those beginners or those with a little bit of experience. The course will take place on Wednesday evenings at the LoveClay workshop facility at Valentine Clays HQ in Fenton. Nick intends to migrate the making to working from Earthenware to Stoneware clay’s which will create different options for creativity. One of the weeks will be spent making pieces for a raku firing which will then take place towards the end of the course. There are a maximum of 10 places available to ensure there is a one to one experience to help you to develop your ideas. Basic materials and tools will be provided. Please discuss further requirements with your tutor. The course will be run by trained potter and teacher Nicholas Marsh who has been making a professional career within the pottery world for the past thirty years. Nick has been privileged to live and work in a variety of locations throughout the world each with a distinctive influence which can be clearly seen within his work. Should you need to cancel your booking your cancellation must be received in writing at least 14 days prior to the event. A full refund will be made of any fees paid. We are unable to process a refund for cancellations received less than 14 days prior to the event. Should it be necessary due to reasons beyond our control to cancel an event then our liability is limited to a full refund of the event fee paid.